Students may be eligible to earn credits based on previous education or applicable workplace experience. myPathways provides Sheridan students with many options to advance their academic standing. Sheridan students can apply previously acquired learning credits towards their current program of study. Peruse the tabs below to see details about all of your options. The Credit Transfer Check tool will allow you to view possible credit transfers for courses completed at another Ontario postsecondary institution. † this tool is only accessible from within Sheridan at this time. 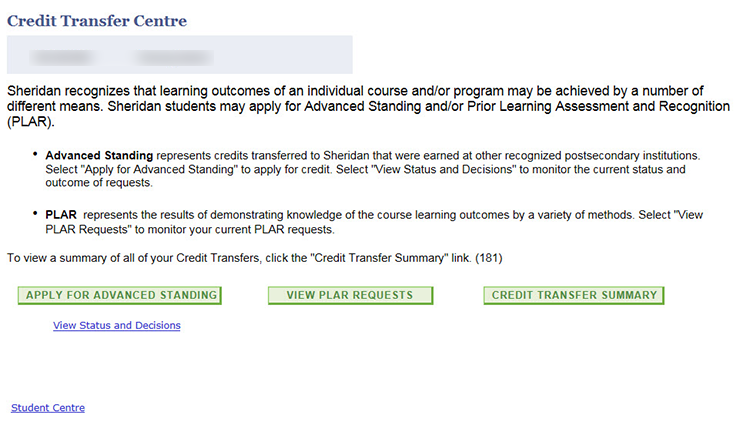 The use of Advanced Standing credits is subject to the requirements of Sheridan's Credit Transfer Policy and Graduation Policy. The Sheridan Graduation Policy allows you to transfer up to 75% of the required course load. Students registered in post-secondary programs who wish to apply for Advanced Standing will need to use Sheridan's online service. See the How to Apply section below. Please note: information regarding Advanced Standing is subject to change. Candidates must have achieved a minimum course grade of 60% or the minimum pass for promotion within the program; whichever is higher, for a request for advanced standing to be considered. New students will have access to the online application for advanced standing once a fee payment has been processed. Returning students that have not made a fee payment for the following term, or students that are not returning, may apply for advanced standing until the last day of classes of the current term. Before applying for Advanced Standing it is important to take into account the impact that a successful application will have on your academic and financial status, particularly if it effects your course load. Advanced Standing will be awarded for the term in which the application was submitted. If advanced standing is granted, it may fulfill future term requirements. 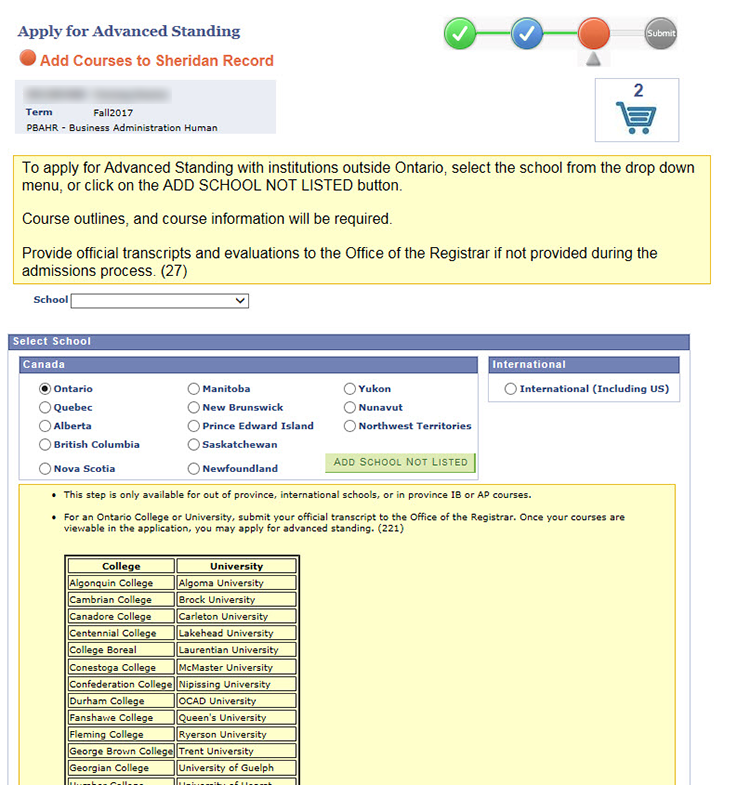 Students are advised to review their academic requirements page in their student centre account. Dropping to a part-time status can impact your ability to access OSAP funds, bursaries and other forms of financial support. Students applying for Advanced Standing are advised not to drop courses until approval has been granted by the College. If you have been granted Advanced Standing after the fifth day of term you will not be able to add a new course to your timetable to replace that course. In some cases, a student may take a course at another accredited postsecondary institution and apply credit towards their Sheridan credential. A letter of permission is required and must be authorized by an appropriate faculty member. Students may request advanced standing for courses regardless of when they were completed. However, Sheridan reserves the right to deny Advanced Standing requests for courses completed more than 5 years ago based upon current relevancy of course content. Co-op placements are not eligible for Advanced Standing. 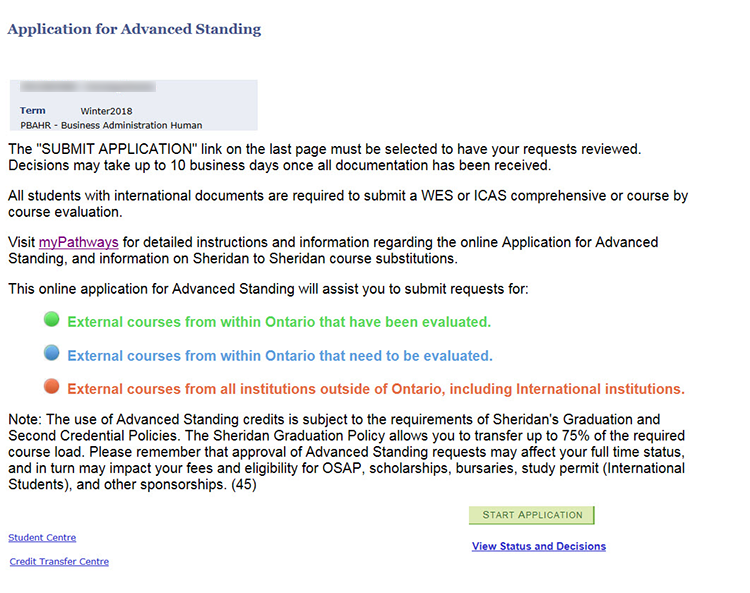 Sheridan's Online Application for Advanced Standing is only available to post-secondary students. Students in a Continuing and Professional Studies (FCAPS) program must apply for Advanced Standing through FCAPS. All students with International transcripts wishing to apply for Advanced Standing must provide verified transcripts and evaluation reports from either World Education Services (WES) or the International Credential Assessment Service of Canada (ICAS). Individual course outlines from the year the course was completed are required in order to have the Advanced Standing request processed. If you do not have copies please contact your previous institution to request outlines. Please note: General Report or Document-By-Document Reports will not be accepted for Advanced Standing. If you have submitted official transcripts to the International Centre during the application process it is not necessary to resubmit them for the online Application for Advanced Standing. If you have submitted a Comprehensive or Course-By-Course report to the Admissions Office during the application process, and have applied for Advanced Standing through the online application, please email pathways@sheridancollege.ca. Submitting duplicate copies of the report is not necessary. Students with international education should provide the best information to support the application. Students should enter the Course Subject and Course Number when this information is provided on the transcript, however, when not available, enter the first few letters of the course name as the course subject code, and the line number on the evaluation as the course number code. Enter the full course title, grade, and credit value from the evaluation report. When applying for Advanced Standing for a non-evaluated course you must include a detailed course outline documenting the learning outcomes and the length of the external course. 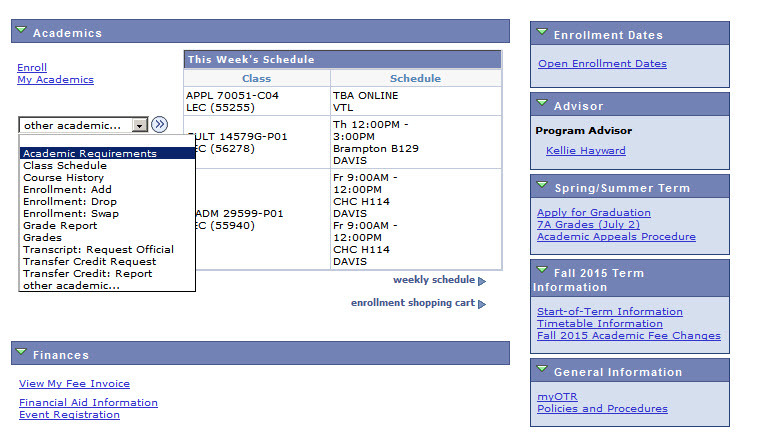 Below are some links to the Course Outline pages at other Ontario Colleges for your convenience and reference. * No specific course outline request info available. Contact the institution for more info. Before starting your application make sure that you satisfy the requirements for Advanced Standing. You must also take into account the academic and financial implications of a successful Advanced Standing request. 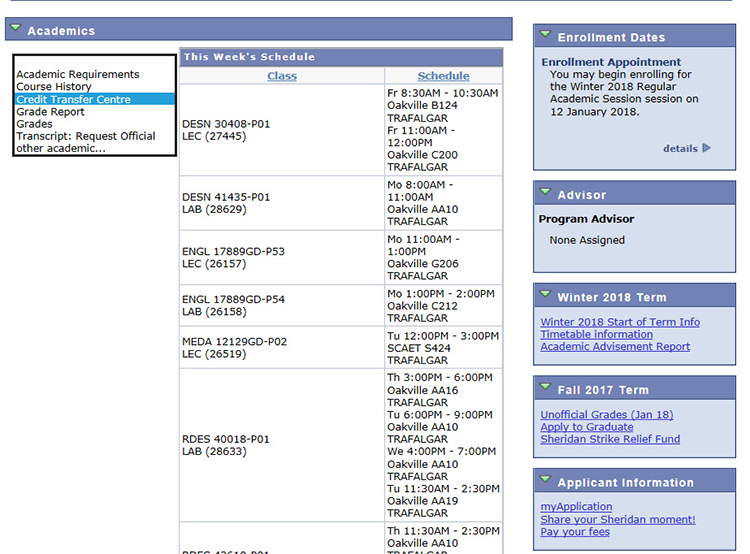 Under the "Academics" section, click on the drop down menu and select "Credit Transfer Centre". Click the button Apply for Advanced Standing. Click the “Start Application” button to proceed. 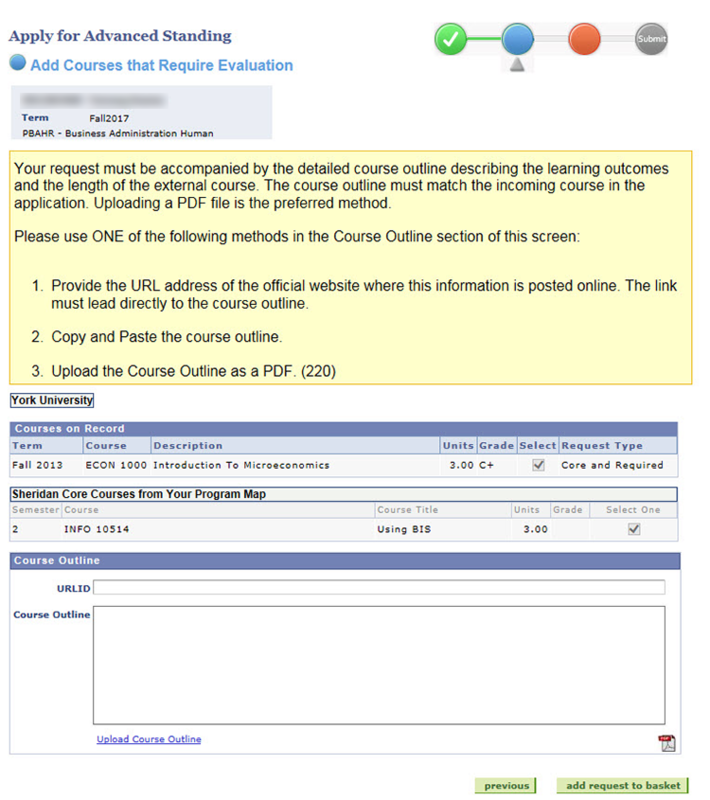 If adding a course that has already been evaluated to your Advanced Standing application, simply check the check box under the “Select” column to select the relevant course(s) and click “Next”. 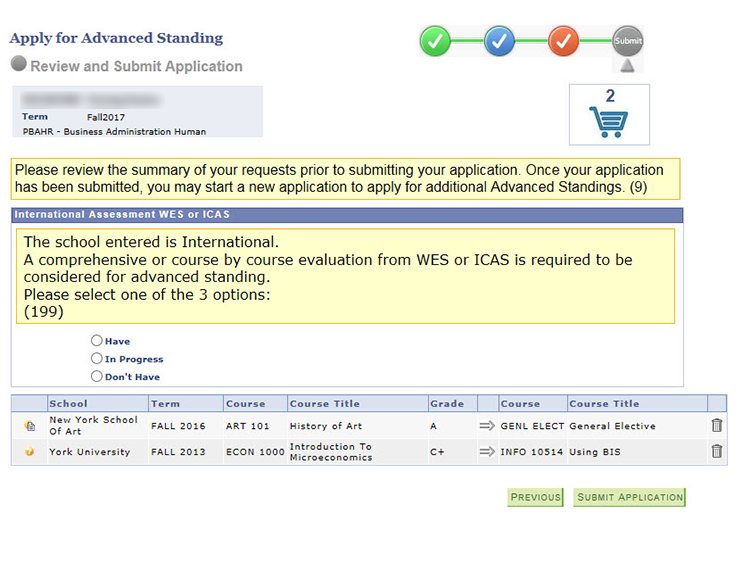 If you are only adding evaulated courses, click the Next button until you reach the end of the application and then Submit. 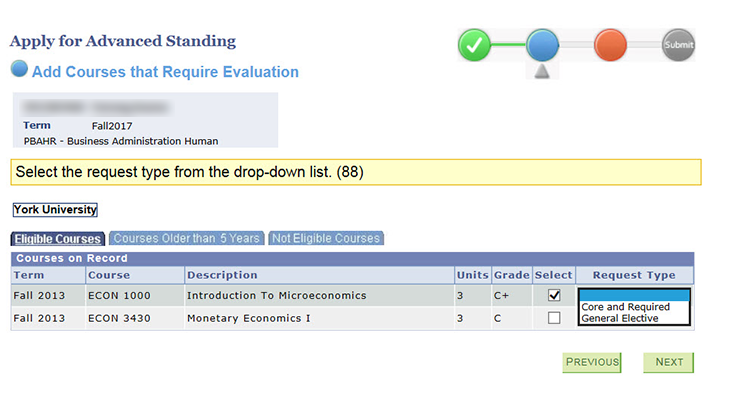 To add non-evaluated eligible courses check the check box under the “Select” column to select the course(s). You must provide a course outline, as well as the course code, course name, grade, semester/year taken, official grade on transcript and credit value. Click "Next" to proceed through the steps illustrated below. 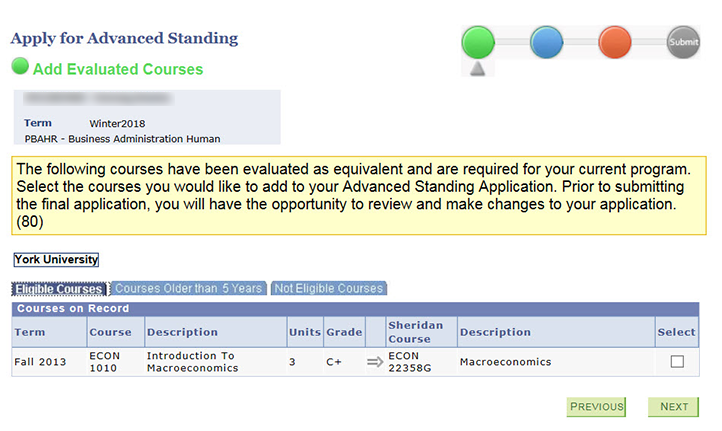 For courses older than five years, students may request advanced standing for courses regardless of when they were completed. However, Sheridan reserves the right to deny Advanced Standing requests for courses completed more than five years ago based upon current relevancy of course content. You will need to specify if each course is a Core course or a Gen-Ed/ Breadth elective. Choose the appropriate option under the “Request Type" column. You may only select one course at a time. Click add request to basket when you are done. 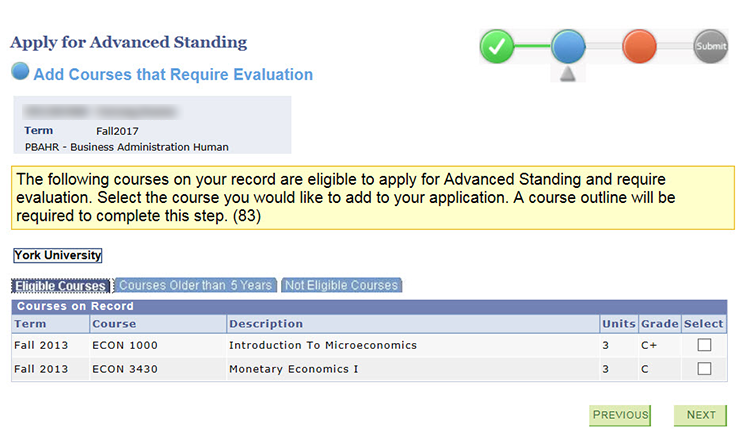 Once you have successfully added a course to your Advanced Standing application, the number of requests in your application will be displayed in the top right portion of your screen (see image in step 9). From this page you can either add additional courses or click “Next” to proceed to the next stage. 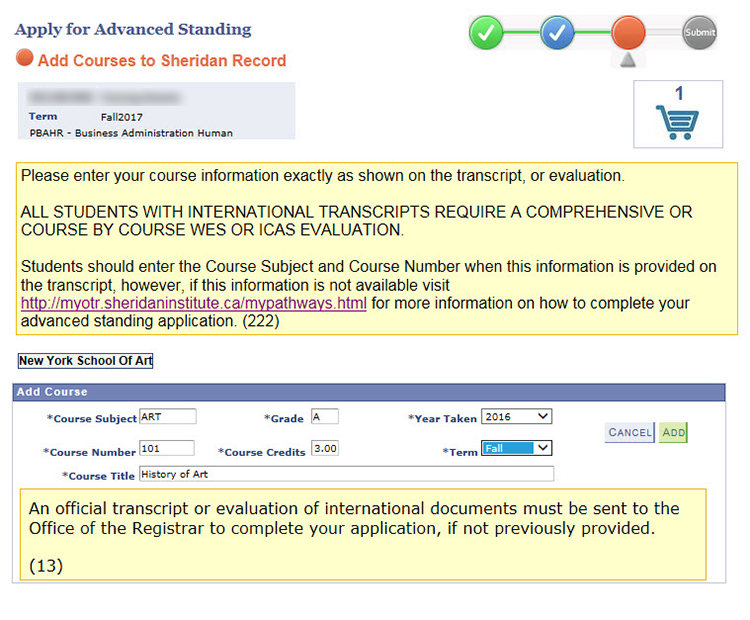 If you are only adding courses currently on your Sheridan record, proceed to Step 13. Click the Add School button to apply for advanced standing using your educational experience from institutions outside of Ontario. Select a school from another Canadian province or International location. Once you make your selection, you will be able to choose from the list of schools on screen. If your school is not listed, choose the Add School Not Listed button and enter the details. Your chosen school will appear on the next screen. Choose the Add Course button to proceed. Enter the course information requested on screen as illustrated below. Please note: that Grade, Year Taken, Course Credits, Term and Course Title are mandatory fields. Your application can only be completed once the Office of the Registrar has received an official transcript or evaluation. Review your application. You can use the Previous button to step back and make any changes. Use the trash icon to delete any entries you may want to remove. Click Submit Application once you are ready to proceed. A pop up panel will confirm that your application for advanced standing has been successfully submitted. Click "OK" to dismiss the pop up. Have knowledge gained outside of education? With Prior Learning Assessment and Recognition (PLAR) you can earn credits towards a Sheridan credential based on your previous education and applicable workplace experience. For complete details, you are strongly encouraged to to review the Prior Learning Assessment & Recognition Policy and the Prior Learning Assessment & Recognition Procedure. Students and applicants are encouraged to apply for PLAR as early as possible, and at least three weeks prior to the course or work term start date. When a student is currently enrolled in the course they are seeking PLAR for, the deadline to apply is the tenth day of term. Students wishing to PLAR a course for a future term should pursue PLAR early in their program of study. that reasonable evidence of additional relevant learning can be provided/demonstrated. Similarly, PLAR is not an appropriate means for students to raise a grade in a course taken previously at Sheridan. The first step in your PLAR application is to complete a PLAR self-assessment form to determine if you are eligible to apply for PLAR. Trafalgar – Office of the Registrar, Room D100 (8:30 a.m. - 4:30 p.m. If you meet the PLAR eligibility criteria, your PLAR advisor will add the Program Coordinator information to the self-assessment form and refer you to the Program Coordinator. You will present the Program Coordinator with your self-assessment form. The Program Coordinator reviews the form and determines eligibility with OTR, and recommends if you should pursue PLAR. To proceed with your application you must first pay the PLAR application fee of $117.58 and submit the PLAR Waiver Form (available from the OTR when you make your fee payment). Payments for PLAR assessments must be made in person. You can make your payment at a front counter of any campus. The OTR cannot accept cash or credit card payments. Working with your PLAR Assessor (or Program Coordinator), you will create an Action Plan. The purpose of the Action Plan is to ensure both applicant and assessor are clear on and agree to the nature of the demonstrations of learning, timelines, content, and process. It should be signed off by both parties and amended, in the same way, as appropriate. Complete action plan and tasks. You can consult with your PLAR Assessor as you complete your Action Plan. Both you and your assessor will follow the timelines as indicated on the Action Plan to complete and assess the tasks. Once the PLAR process is complete, the Program Coordinator and/or Assessor completes information as required on the PLAR application form. The application form (now with the PLAR results) is submitted to the Office of the Registrar, who will update your academic record. If an ‘F’ grade is awarded, the ‘F’ grade will not be placed on the your Student Record but the application will count as a PLAR attempt. You will be notified of results by the Academic Faculty. Students may appeal decisions as per the Academic Appeals and Consideration Policy. Sheridan to Sheridan credit equivalency is where a previously completed course with at least an 80% match is substituted in a new program to meet a requirement. To request a course substitution, the student contacts the appropriate coordinator – Program Coordinator, English Coordinator, Breadth Coordinator, or General Elective Coordinator – to make the request. Courses with the exact same course code (COMM 19999 for example), or electives that will meet the new program requirements will automatically be counted towards credit towards the new program. Students are encouraged to check the "Academic Requirements" link (see example below) in the Academics section of the myStudent Centre account to view any completed courses that are being used for the new program. Please note: Students should continue to attend classes until official notification that the course substitution has been approved. If the course substitution is approved, and reduces your course/credit load to less than 60%, it will affect your eligibility for OSAP. Check with the Financial Aid Office if you are uncertain of your eligibility. The original grade received will be counted in the GPA calculation of the program the course is transferred to. What is the difference between course equivalency and substitution? How is it different from Advanced Standing? The original course is approved as a substitution. The grade earned is used in GPA calculation. In both cases, the originally earned grade will be counted in and affect the new program GPA. In addition to a number of exciting pathways between its own programs, Sheridan has transfer agreements with universities and colleges around the world. A Sheridan diploma may also lead to admission into a degree program. For more information, visit pathways.sheridancollege.ca or visit ontransfer.ca for a guide to credit transfers between Ontario colleges and universities. The compatibility of your diploma studies with the program you wish to enter. Your overall academic average at Sheridan and, in some cases, your individual course marks. Students usually need to complete more than one year of study at Sheridan to be eligible for transfer credit(s). Some institutions grant “block transfer credit” based on the length of your studies. Other institutions assess transfer credit on a course-by-course basis (advanced standing). It’s important that you check with the Admissions Office. To be eligible for Block Transfer of credit towards Degree Breadth, General Education courses must be assigned a minimum of 3.0 credit hours per course and not given credit consideration towards core degree programs of study. Prior credit for 2 General Education courses with a minimum CGPA of 3.0, where the student has earned a minimum grade of 60% (C) in each course, will be awarded a credit equivalence of 1 Degree Breadth course. Credits acquired through this block transfer arrangement serve to satisfy general introductory breadth credit in a broad field of study (Humanities, Social Science, Global Culture, Mathematics, or Science) at the degree level. Prior credit for 3 General Education courses with a minimum CGPA of 3.0, where the student has earned a minimum grade of 60% (C) in each course, will be awarded a credit equivalence of 2 Degree Breadth courses. Credits acquired through this block transfer arrangement serve to satisfy general introductory breadth credit in a broad field of study (Humanities, Social Science, Global Culture, Mathematics, or Science) at the degree level. Prior credit for 4 General Education courses with a minimum CGPA of 3.0, where the student has earned a minimum grade of 60% (C) in each course, will be awarded a credit equivalence of 3 Degree Breadth courses. Credits acquired through this block transfer arrangement serve to satisfy general introductory breadth credit in a broad field of study (Humanities, Social Science, Global Culture, Mathematics, or Science) at the degree level. Note: While credits acquired through a block transfer arrangement may not serve to fulfill a course-specific prerequisite requirement, such credits do serve to satisfy the requirements of the breadth policy at the introductory level in each of the designated fields of study.